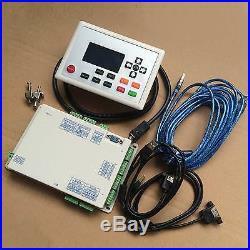 New DSP CO2 Laser Cutter Engraver Machine LCD Motion Controller System PH3. Brand New, High Quality and Extra Long Life. The controller support up to 4 different axis. X/Y/Z/U : X/Y axis are used for normal engraving/cutting. The Z axis is used for the motorized table. The U axis is used for the automatic feeding systems. User can add the auto focus function for the machine, this is very convenient for the new users. User can set smaller power in the corners to the the best cutting result. The controller will record the last cutting/engraving point. Even there's a sudden power cut off, user can still continue the job without waste the time and also the materials. Support DXF, CDR, AI, PLT, JPG, PNG, BMP, DST, DSB, GIF, MNG, TIF, TGA, PCX, JP2, JPC, PGX, RAS, PNM, SKA, RAW. Cut or engrave vector formats directly. Engrave photos directly, use can take a photo and then load to the software and then engrave a good quality photo directly. Provide multiple optimization for cutting path. User can draw and edit graphcs directly in the software. And user can also use enlarge/rotate/copy and many other functions. User can set the jobs into several different layers and then set different layers with different speed and power. Thus achieve a complicated job just in one turn. Support array output and automatically fill the work area with max graphics. And the software can also simulate the jobs. Thus, user can preview the job before engraving/cutting. The "Run Box" function can help user to locate the work before engraving/cutting thus, user can put the materials on the correct position. User can set the start cutting point freely and easily. User can even engrave 3D figures directly by using our controller and get a very good result. 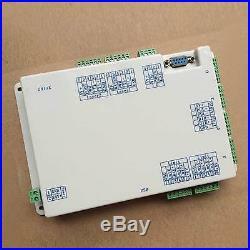 User can install our controller in a dual laser systems. And the power and speed of different laser heads can be set separately. Special plug-in for Autocad and coreldraw. User can edit files directly from these softwares and then switch into our laser software directly. The display can show all functions on the screen directly. This is very convenient for the user to change the settings and even change into different jobs directly without a PC. The air blowing can also be controlled by the controller. The rotary engraving function is very difficult to use from other brands of controller. But for our controller, user only need to change the diameter of the target directly without changing other settings. This is really good for engrave cylindric materials. When the user open the flap(cover) of the machine, the laser will stop working. Thus, keep the user in safe. When there's no water or any problem happen to the water cooling system, the laser will stop working to keep the laser system in safe. User can add a pedal switch for the controller. This is very useful for some special jobs. 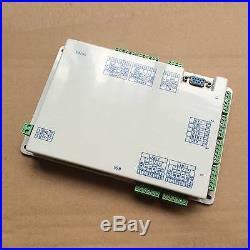 Controller board with Aluminum case. USB cableUSB extended cable network cable Panel connection cable. Return must in original package. 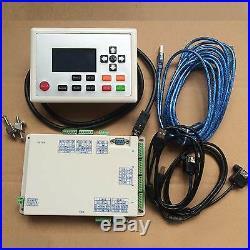 The item "New DSP CO2 Laser Cutter Engraver Machine LCD Motion Controller System PH3" is in sale since Tuesday, October 22, 2013. This item is in the category "Home, Furniture & DIY\Appliances\Other Appliances". 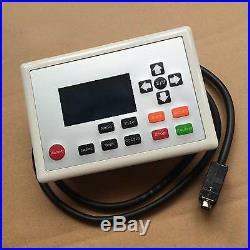 The seller is "win-win-mechatronic" and is located in DHL express door to door service. This item can be shipped worldwide.